Henry (Harry) ORMSBY was born on 10 June 1911 in Brickrow Farm, Ayrshire, Scotland, the eighth and youngest child of John ORSMBY and his wife Helen Ramsay MUIR. Harry, as he was always known, was named after his uncle Henry ORSMBY and was a benificary in his uncle’s will. Family events provide a glimpse of Harry’s life. Only 16 when his father died in 1927, responsibility for the farm and family fell to him as he was the only surviving son. Harry made the trip to the Registrar’s Office to register his father’s death. Three months later, Harry again made the trip to the Registrar’s office; this time to register the death, at Brickrow Farm, of his uncle Andrew Ormsby. Harry lived with his mother Helen and sisters Helen (Nellie) McNab Steel ORMSBY and Margaret (Peggy) Wilson ORMSBY at Brickrow Farm. In 1929, two years after his father died, he was the informant of the death of his 85 year old grandmother Helen MUIR (maiden surname McNAB) at Brickrow Farm. Cause of her death was ‘senility’ and she had been cared for by the Ormsby family for some years. 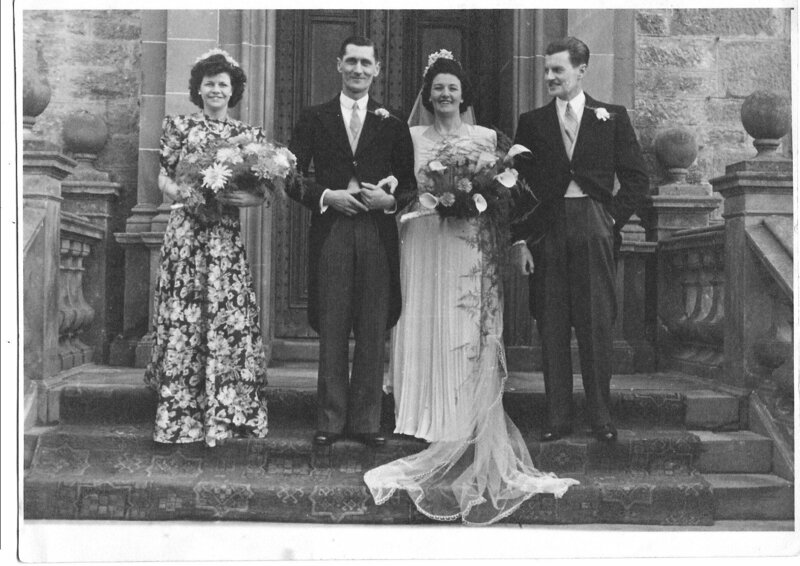 On January 3, 1940 Harry was again a witness to the marriage of a Muir cousin, this time when James Douglas (‘Douglas’) MUIR married Phyllis HEATH, at North Church in Prestwick, Ayrshire. Harry and James appear to have been close cousins since, when Harry (36) married Annie Young SPROAT (40) on 29 January 1947 Douglas was a witness to their marriage. Photo below: left to right; ________, Harry, Annie, and ‘Douglas’ Muir. Photo from the collection of E. H. of South Africa. Annie was born on 27 December 1907 in Skerrington Mains, Hurlford, Ayrshire, Scotland to John SPROAT and Isabella NELSON. Annie’s father had a small land holding just across the road from Brickrow Farm so she and Harry had known each other for years. Annie moved to Brickrow Farm, where her rather formidable and domineering mother-in-law Helen lived. Peggy, Harry’s sister Margaret, took a housekeeping job in East Kilbride and took their mother Helen with her to give the newly married couple more space to themselves at Brickrow Farm. Harry and Annie continued to farm at Brickrow until Harry’s retirement, aged 65, in 1976. Throughout this time, family from Canada stayed in touch and visited whenever they were in Scotland. 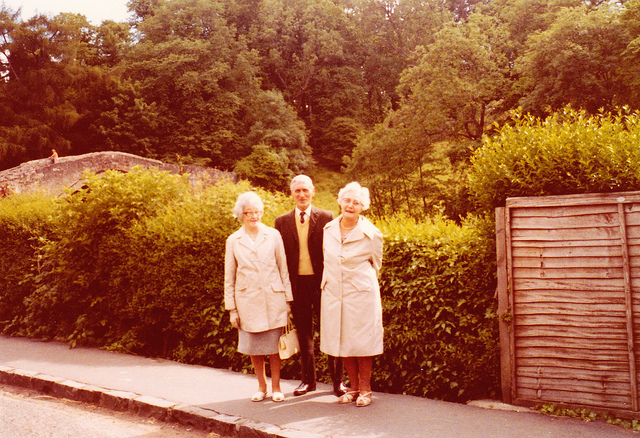 Photo left: Annie, Harry and Margaret Ormsby, taken Alloway, Ayrshire Scotland in 1977 by Elsie (Watson) Slater from Winnipeg. Brig’O’Doon in the background. See Donald Slater’s Flickr site http://www.flickr.com/photos/palaeoecogeek for this an other family photographs. Photo lower left: Annie, Both photos taken 1984 in Ayr, Ayrshire, Scotland. Ayrshire Annie contined to live in Coylton. She died July 8, 1993 in Ballochmyle Hospital, Mauchline, Ayrshire, Scotland.